Almost anyone in some way connected to the control, automation, and manufacturing operations field can benefit from knowing the ISA-95 standard’s content – vendors, end users, integrators, technicians, operators, managers, and CEOs. As the title, “Enterprise-Control System Integration,” indicates, the ISA-95 (IEC 62264) standard treats the topic of how you should integrate enterprise business systems (ERP, SCM) with manufacturing and control systems (SCADA, PLC, DCS). The ISA-95 standard is developed with the objective to reduce the cost, risk and errors associated with implementing interfaces between enterprise and production control systems. B2MML is an XML implementation of the ANSI/ISA 95 family of standards. B2MML consists of a set of XML schemas written using the W3C’s XML Schema language (XSD) that implement the data models in the ISA-95 standard. 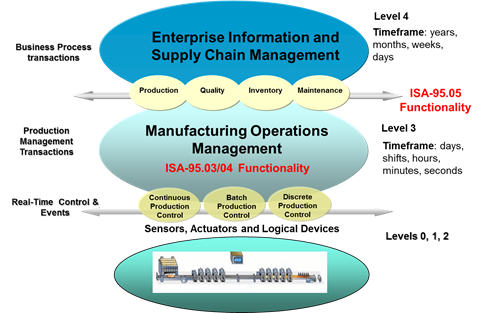 Companies interested in following S95 for integration projects may use B2MML to integrate business systems such as enterprise resource planning and supply chain management systems with manufacturing systems such as control systems and manufacturing execution systems. Use the activity models from part 3 for vendor / solution selections; and so on.